Well, it happened again, I made another Lush order. I think my obsession is spiralling out of control and I need some form of Lush rehab. Failing that, I would like a Lush store to be erected next to my house. Anyone else giggle at the word “erected” there? No? Ok…let’s move on and ignore my immaturity. The Lush order revolved around one thing and one thing only. Last Christmas my brother kindly gifted me a Lush box and inside was Celebrate. I didn’t think too much of it at the time but after a few days of using it my skin was the best it had been in a long time. 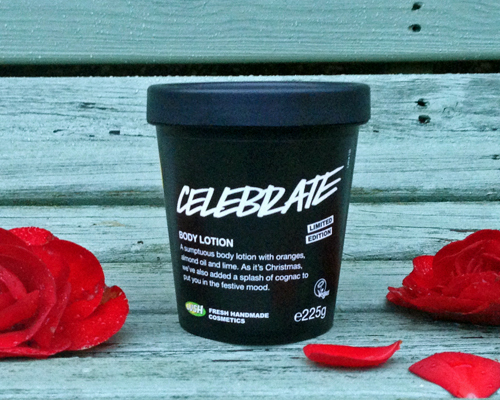 I was absolutely gutted when my little tub of Celebrate ran out and it turned out to be limited edition. Fortunately Lush have brought it back once again for the festive season (just ignore the fact it returned in September) so I immediately purchased it. Another limited edition item I purchased is Snow Fairy. Everyone and I mean everyone raved about this shower gel last year but I never actually considered buying it and kind of regretted it. Once I noticed it had returned for Christmas I bought it just to see what the fuss is about. I’m not entirely sold on the scent so far but I have yet to use the shower gel so maybe it will grow on me. This may be another case of “don’t believe the hype” (hands up if you just said that in Alex Turner’s accent to yourself). Sympathy for the Skin is a moisturiser I’ve banged on about in the past but this purchase is not for me. Despite the fact I love Sympathy for the Skin I’m trying out other moisturisers from Lush so this was purchased for my mum. She’s a huge fan of this moisturiser and I’ve lost count as to how many tubs she’s gone through. My mum has good taste! The last product was not actually part of my original order but I decided to include it anyway; I don’t want to hurt its feelings by leaving it out after all. My parents recently went to London and I’m fairly certain my dad went in search of a Lush store (despite what he says). They ended up buying me Happy Happy as they’re cute little parents who like to give their daughter nice things. They may actually be telling me I smell and need to shower more. Dear god I hope it’s the former! Well there’s my little Lush haul. I really need to start spacing out my Lush related posts but I can’t help it, I’m becoming a Lush enthusiast. Help! Did anyone else recoil in horror when they looked at the date and realised it’s now October? Tomorrow I will be 3 months away from turning 22 and it’s safe to say I’m dreading it. 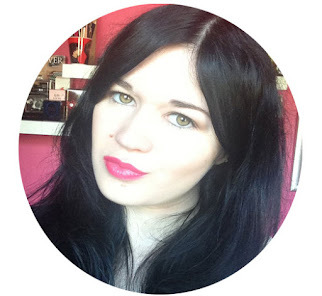 That’s an entirely different post in itself though so let’s just stick to my September Favourites in this one. Pink Punch has barely left my nails since I purchased it. I hadn’t bought a nail polish in a long, long time so as soon as I saw Pink Punch I immediately snapped it up. Barry M Gelly Hi-Shine nail polishes are incredible (although I usually have difficulty applying a second coat for some strange reason) and Pink Punch is no exception to that. It’s long lasting, looks amazing on and best of all, it was only £3.99. 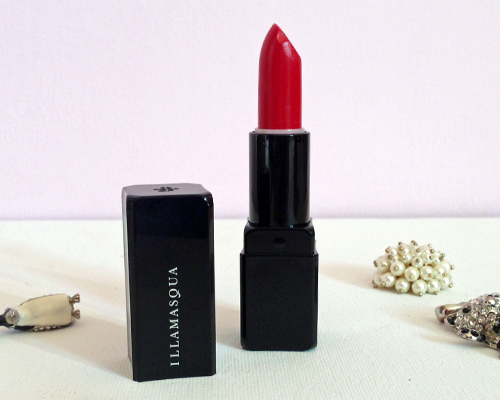 If you read my review on Illamasqua Virgin then you’ll know I wasn’t overly pleased with the fact it’s more of pink rather than the true red I believed it would be. Despite that though, I’ve been rocking it as often as I can. Although it’s not the shade I expected it is still a lovely colour and it’s a fairly long lasting lipstick. It is a shade I was missing from my collection so I think I can get over the fact it’s not the red I wanted. 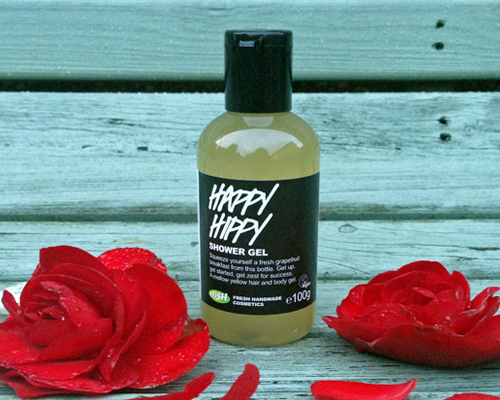 I think this may potentially become my favourite moisturiser of 2014. It’s helped clear up and keep my eczema at bay and those annoying dry patches of skin I usually get have completely disappeared. 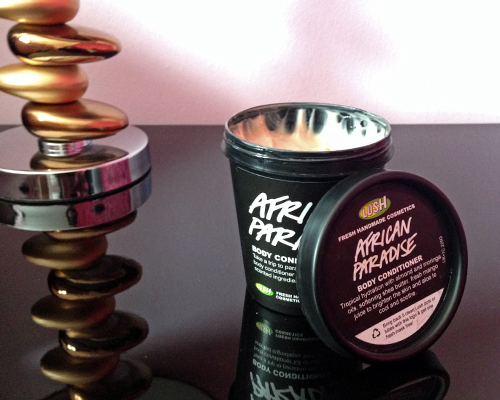 As mentioned in my review of African Paradise I’m not a fan of the smell but I can overlook that since it does such a great job at moisturising my skin. Another win for Lush. My lovely Litas were abandoned throughout the summer mainly because Scotland actually warmed up but also because they were in dire need of being resoled. There was a day in July when I decided to wear them and as soon as I picked them up the little stubby bit on the heel (what is that even called?) fell right off. In all fairness it had been coming off since around December but I just never bothered to fix it properly. 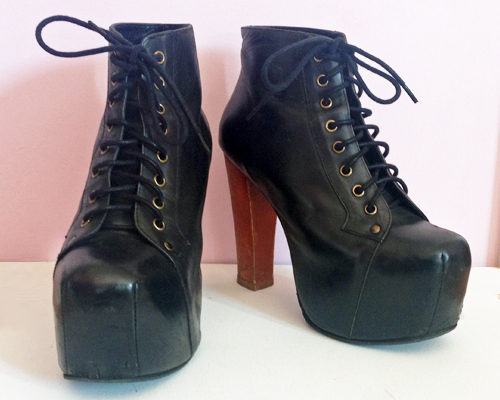 Now that my Litas have been resoled I’ve been wearing them non stop. I know they’re not everyone’s kind of shoe but they’re so comfortable, go with the majority of my wardrobe and they’re incredibly easy to walk in. Thank god I finally had them fixed. Ok so technically the NFL came back in August but that was just the pre season, now it’s the regular season and I’m practically drooling at the mouth. Annoyingly we’re already a quarter of the way through the season but my adorable Chargers are sitting pretty at 3-1 and hopefully that will go up to 4-1 when we play the Jets tomorrow. I still maintain we shouldn’t have lost that Cardinals game but hey, we beat the Seahawk so screw it. So there’s my September Favourites. I was actually planning on just writing about my new Chargers jersey but I didn’t want to come across as some obsessed lunatic. I think the fact I’ve just told you that outs me an obsessed lunatic anyway. You probably already knew that though so hey ho. Ok now I’m just rambling so I shall end this post right about…now. While wandering the streets of Edinburgh in July I just happened to end up in Lush - ok, I was deliberately walking towards Lush but let’s pretend it was by complete accident. 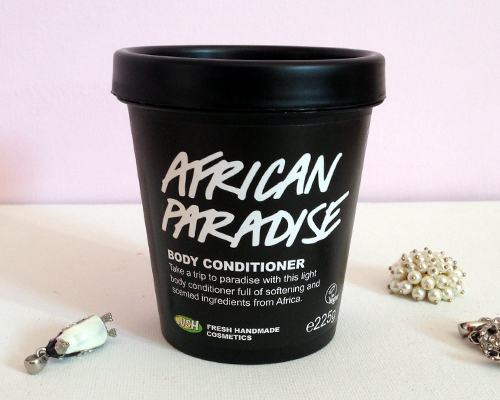 I don’t want my Lush obsession outed on my own blog - I immediately scurried over to where their moisturisers and body conditioners live and it was there where I discovered African Paradise. This is starting to sound like an introduction to a really lame YA novel. Let’s move on shall we? Up until a few months ago I had been using Ro’s Argan Body Conditioner so I was somewhat familiar with Lush’s body conditioners. I was eager to try African Paradise after reading through the list of ingredients (I’m a sucker for anything that contains almond oil) so I popped it in my basket and then proceeded to buy a lot of soap. Now African Paradise is not cheap. 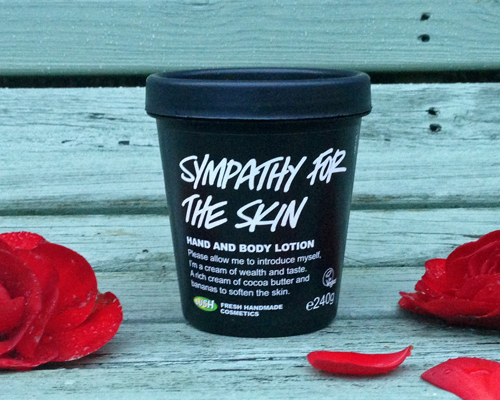 I didn’t bother to check the price before I put it in my basket but I assumed it would be around the £12.00 mark (I was basing this on the price of Sympathy for the Skin and Dream Cream) but nope, it’s £19.95 for a 225g tub. There is some justification in the price as my first tub of African Paradise lasted for 2 months despite being used every single day. It is still a little expensive though especially if you prefer to spend all of your money on sandwiches. African Paradise is supposed to be used like a conditioner. You’re meant to apply it while in the shower or bath before washing it all off and towering yourself dry (or whatever your preferred drying method is). I typically apply it on moderately damp skin after I’ve hopped out of the shower for no real reason. I highly doubt my method of application makes any difference to the overall performance of African Paradise so hey ho, instructions aren’t always cool. Before I started using African Paradise I was dealing with an eczema flare up that just wouldn’t go away. It was predominately a red, dry and itchy patch of skin on the inside of my elbow and none of my moisturisers were clearing it up. I was only using African Paradise for a few days before that stubborn patch of eczema disappeared and all of the dry patches of skin I usually get are yet to return. I do find it takes a good few minutes for African Paradise to completely soak into my skin and I’m really not a fan of the smell. To me it smells a little like talcum powder which randomly reminds me of stinky feet - I can’t even explain that one. Fortunately though the smell isn’t overpowering and I can’t detect it on me once my skin has mopped up all of the moisture. 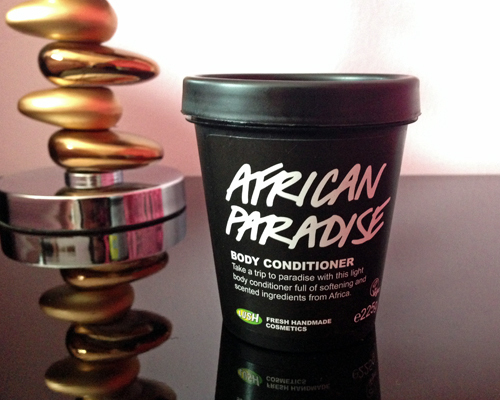 The fact I’ve already purchased my second tub should sum up how I feel about African Paradise. I’m rather enjoying being able to eat copious amounts of dairy without having to worry about an eczema flare up thanks to African Paradise. I’m not entirely sure if I will be purchasing my third tub of it once my current one runs out as I like to explore various moisturisers (did that sound creepy?) but I will definitely return to it one day should I ever stray. 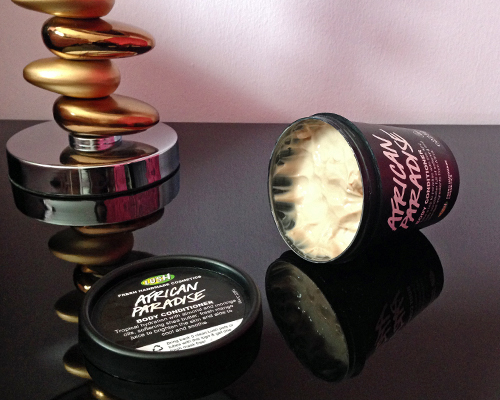 If you’re looking to drop £19.95 on a rather great little tub of lotion may I shove African Paradise in your face? !